Israeli police secure the scene of the Jerusalem attack. (Mahmoud Illean, AP). Security forces locked down parts of Jerusalem's Old City and an ultra-sensitive holy site remained closed after an attack that killed two police officers and heightened Israeli-Palestinian tensions. 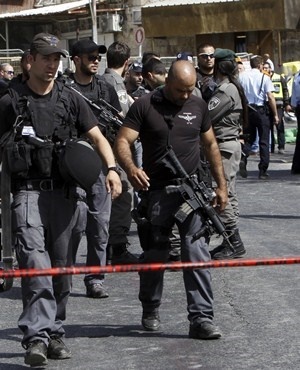 Three Arab Israeli assailants opened fire on Israeli police Friday in the Old City before fleeing to the nearby Haram al-Sharif, known to Jews as the Temple Mount, where they were shot dead by police. Israeli authorities said they had come from the flashpoint holy site, which includes the Al-Aqsa mosque and the Dome of the Rock, to commit the attack. Israeli authorities took the highly unusual decision to close the Al-Aqsa mosque compound for Friday prayers, leading to anger from Muslims and Jordan, the holy site's custodian. Israeli Prime Minister Benjamin Netanyahu has signalled it is to remain closed until at least Sunday while security was assessed. He also spoke of increasing security at entrances to the holy site when it reopens -- likely to be a controversial move. On Saturday, there was restricted access through Damascus Gate, the main entrance used by Palestinians into Jerusalem's Old City, with only residents with identification being allowed to pass.